(Nanowerk News) Manchester scientists have found that gentle heating of targeted nano-sized drug parcels more effectively in deliver them to tumour cells – resulting in an improvement in survival rates (Journal of Controlled Release, "Monoclonal antibody-targeted, temperature-sensitive liposomes: In vivo tumor chemotherapeutics in combination with mild hyperthermia"). One of the clinically-established methods for the delivery of cancer chemotherapy drugs has been to package the drug inside nano-sized containers, known as liposomes. This allows the drug to more effectively localise into cancer tissue and reduces side-effects by limiting drug-infused liposome uptake in healthy cells. 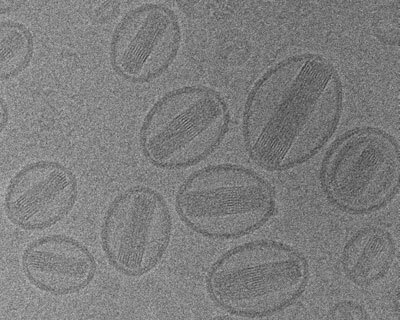 The effectiveness of these liposomes has been further improved by engineering them to contain molecules (monoclonal antibodies) on their surface that allow them to better target cancer cells in combination to making them temperature-sensitive so that they release their therapeutic drug content upon mild heating. Researchers from the Nanomedicine Laboratory at The University of Manchester – part of the Manchester Cancer Research Centre – looked at the benefits of combining both active targeting and temperature-triggered release. The team compared liposomes with and without the ability to actively target cancer cells. They found that in combination with mild heating, the actively targeted liposomes showed greater uptake in tumour tissue in mice than those without targeting ability. This resulted in a moderate improvement in the animals’ survival. “We have successfully developed heat-activated and antibody-targeted liposomes to show that they are chemically and structurally stable. This approach may help us develop novel mechanistic strategies to improve targeted drug delivery and release within tumour tissue, while better sparing normal cells,” added Professor Kostarelos.